Great house, great views! Epic sunset! It was nice to get a call the night before to see if I had any questions. We enjoyed our stay and would stay there again. Loved the views. House was clean and nicely appointed. Plenty of room. Kitchen well equipped. Easy to work with and attentive. Dealt with any problem or concern quickly. Always friendly. We did not want to leave. A lovely comfortable home. Very available and a pleasure to work with. Stay was great. Hot tub and view made the experience. Thanks again! We enjoyed ourselves. The view, hot tub, plants and wildlife is pure heaven. The cottage with amenities, and the time and space to enjoy the coastline has the greatest beauty and comfort. Great views, comfortable, clean, we had a great time. Information about the property was accurate and the hosts were helpful and courteous. We really liked it! Clean, comfortable, had an accurate description with lots of detailed information and instructions. Excellent. Sherry was very helpful & friendly! The rental process was super easy. It was a great place, tucked away from everything and perfectly relaxing. This is a fantastic property in an outstandingly beautiful location. We have been twice now, once as a couple and once with our whole family (2 adults and 3 teenagers). Everyone loves the house. Went kayaking, biking, beachcombing, and hiking. Surrounded by beauty! The amenities are comparable to the four seasons hotel. I had a great experience working with Sherry. She was extremely helpful and knowledgeable. She was able to answer all my questions and set me up with the dates I needed for my trip. It was a lovely little cottage which good amenities. We enjoyed the views, had fun playing the boards games, and made great use of the kitchen. It was great kayaking on the river and seeing the seals. I enjoyed being close to the river and the ocean. The hostess was welcoming and warm. Your team was awesome. Friendly and helpful. The team left no questions unanswered. They were very thorough. Everything was clean and in order when we arrived. The home is very well equipped with everything to make our stay very enjoyable (and it is pet friendly). The home is cozy and comfortable and quiet. The views of the mountains are wonderful. The weather was picture perfect and we used all three decks and the hot tub. We barbequed one evening and ate out at a nearby restaurant the next. We hated to leave, but we will definitely return. 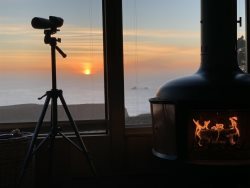 Lovely vacation property with gorgeous views of both the Russian River and the Pacific Ocean. Very comfortable for our family of four. Our only regret is that we weren't able to stay longer! We spent a delightful Mothers Day weekend with our son, daughter in law and granddaughter at Tidesong. Beautiful views and clean, comfortable setting. More amenities than usually found at a rental home. Highly recommend.